BUENOS AIRES, Argentina (AP) Top-seeded Kei Nishikori overcame a slow start to beat local favorite Diego Schwartzman 5-7, 6-2, 6-2 in a second-round match Wednesday at the Argentina Open. Nishikori, No. 5 in the ATP rankings, needed 2 hours, 6 minutes to advance. The Japanese star will next play Joao Sousa of Portugal in the quarterfinals. 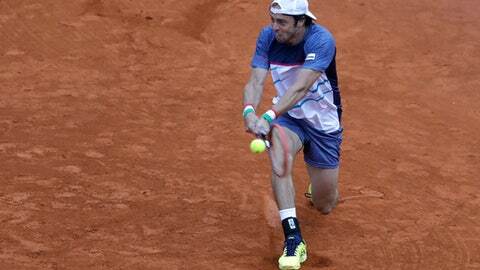 Earlier, Gerald Melzer of Austria upset eighth-seeded Paolo Lorenzi of Italy 6-3, 6-3 in the first round. And No. 5 Albert Ramos-Vinolas advanced in his second-round match when Argentina’s unseeded Leonardo Mayer retired in the third set with an injury. Ramos-Vinolas was leading 6-7 (4), 7-6 (3), 1-0.